“Dr. Esther has developed a unique style and format to help honest seekers and believers to better understand all the commandments of God. The index serves as an easy guide to finding biblical answers to many of the problems of life faced by people around the world. This book will serve to remind those who take time to read it and meditate upon the Holy Scriptures contained in it that there is no higher goal than to seek and apply the wisdom of the Ancient of Days in our own lives. How is this precious book different from other books? 1. Divinely inspired book which answers all questions in life…This book is an easy guide to find Biblical answers to many of the problems of life faced by people around the world. It has solutions to all the problems you face in life. 2. Unique & extremely simplified book to receive blessings from God…Everyone wants to know the easy way out in life. Most people seek quick ways and means to receive prosperity and blessings. No pain, no gain in life. Obedience to God’s Commandments is the only way you can receive blessings from God. This book brings out all the Commandments that you need to obey in order to inherit all the blessings of God in your lives, in such simplicity in a tabular format for easy understanding. 3. 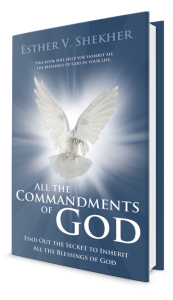 Highlights Rewards & Consequences…This book not only highlights the blessings but also points out the consequences for not obeying God’s Commandments. The rewards highlighted in this book will entice the readers to obey God’s Commandments so that they can walk in the blessings of God, for example, good health, peace of mind, deliverance from bondages, etc. 4. Security for your family…Obedience to the Commandments of God mentioned in this book offer protection for you and security for your children from famine, plagues, accidents, murder, theft, violence, poverty, etc. 5. Hope & Confidence in life…The Scriptures mentioned in this book give you hope during trouble times and provides wisdom, confidence, inner power and strength to combat any battle in life and rise up above any situation in flying colors. For example, it will help you mend your troubled marriage, ways to come out of depression and suicidal tendencies, etc. 6. Covers all aspects of life…This beautiful book will help believers and Servants of Christ. It brings out the importance of prayer, family life, Christ’s sufferings and His death on the cross, Christ’s Second Coming, attributes of the Holy Spirit and various other aspects of life, with Biblical references. It also teaches you how to fear God and obey His Commandments. 7. Explains ways to receive healing for the Body and Soul…This book will help you receive healing for your various sicknesses such as, cancer, aids, stroke etc. through faith in Christ and His Word. It will also help you receive emotional healing. Copyright © 2014. Dr. Esther V. Shekher. All rights reserved.